[media-credit name=”South Point Casino” align=”aligncenter” width=”640″] [/media-credit]I will be holding a book signing for Eagle Talons, The Iron Chronicles–Book One, at the South Point Hotel, Spa & Casino, at 9777 Las Vegas Boulevard, Las Vegas, Nevada, on Friday, December 12, 2014. South Point has produced this fantastic poster to advertise the event within the casino. I mentioned this event in my blog post of December 8, but I will repeat portions of it in this special posting for the benefit of those who may not have seen the original. The book signing event will take place from Noon until 4 PM, in the Silverado Lounge at South Point. 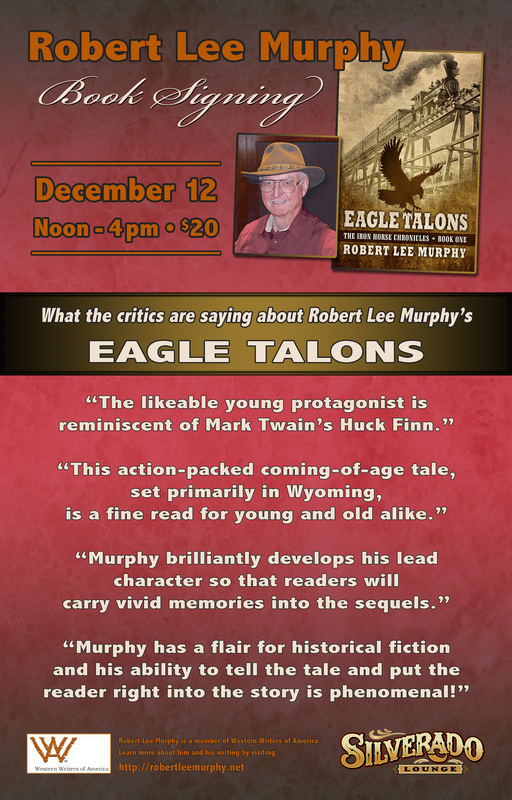 This special event, to sell and autograph copies of Eagle Talons, is not part of a larger book selling event, but is a one-of-a-kind happening arranged through the efforts of my wife, Barbara, and our good friends in the management and operation of South Point. As a special treat, our daughter Elizabeth, is flying in from California to lend a hand. She has sewn a period costume and will be dressed as Jenny McNabb, Will Braddock’s young lady friend from Eagle Talons. This South Point event takes place on the next to last day of the National Finals Rodeo, which is held annually in Las Vegas. South Point Hotel, Casino & Spa, is a favorite venue for many of the rodeo participants and attendees. If you are in the area, stop by and enjoy all the cowboys and cowgirls . . . and Jenny McNabb! This entry was posted in Eagle Talons - Book One, Iron Horse Chronicles' Characters, The Iron Horse Chronicles and tagged Adventure Fiction, Eagle Talons, Fictional Character, First Transcontinental Railroad, Historical Fiction, Jenny McNabb, Pioneer Life, Teen Fiction, The Iron Horse Chronicles, Western Fiction, Western Writers of America, Will Braddock, Young Adult Fiction, Young Readers. Bookmark the permalink.